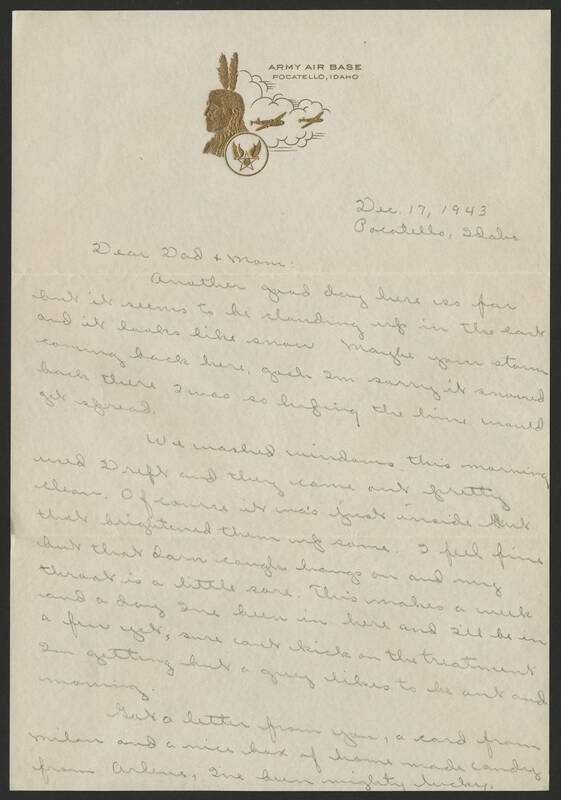 Dec. 17, 1943 Pocatello, Idaho Dear Dad & Mom: Another good day here so far but it seems to be clouding up in the east and it looks like snow Maybe your storm coming back here. Gosh Im sorry it snowed back there I was so hoping the lime would get spread. We washed windows this morning used Dreft and they came out pretty clean. Of course it was just inside but that brightened them up some. I feel fine but that darn cough hangs on and my throat is a little sore. This makes a week and a day Ive been in here and I'll be in a [?] yet, sure cant kick on the treatment Im getting but a guy likes to be out and moving. Got a letter from you, a card from Milan and a nice box of home made candy from Arlene, I've been mighty lucky.